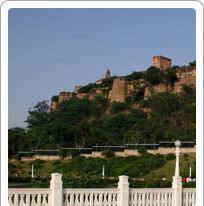 Moti Dongri meaning the Hill Of Pearls is a small hill in Jaipur. A temple dedicated to Lord Ganesha and a palace are situated on the hill. The temple is a popular tourist attraction as it has a bird's eye view of the zone and also has religious significance for Hindus. The palace is occupied by Rajmata Gayatri Devi and her son, Jagat Singh. Designed like a Scottish castle, the palace has a charming exterior but is not open for public viewing.